Early rumors about this year’s iPhones suggest Apple is going to launch three models, just like it did last year. The new iPhones’ form factor is also said to be similar to their predecessors. But Apple is planning to make some interesting changes to get consumers to upgrade. According to a report from Bloomberg, the Apple iPhone 11 Max would sport three camera lenses on the back. The other two models are said to get dual rear cameras. Sources told Bloomberg that adding a third lens on the iPhone 11 Max is only an iterative upgrade before a much bigger camera upgrade arrives with 2020 iPhones. Android vendors such as LG Electronics and Huawei have already launched phones with three rear cameras. The triple camera setup on Huawei Mate 20 Pro and the LG V40 ThinQ allows them to capture wide-angle photos and videos. The Apple iPhone 11 Max will get similar capabilities this year. The third, ultra wide-angle lens on the iPhone 11 Max would expand the zoom range of the device. An enhanced pixel count could allow the software to repair a photo or video if one of the subjects gets cut out of the frame. It would be able to fetch data from more than one sensor simultaneously to automatically add details from one sensor to another sensor’s shot. 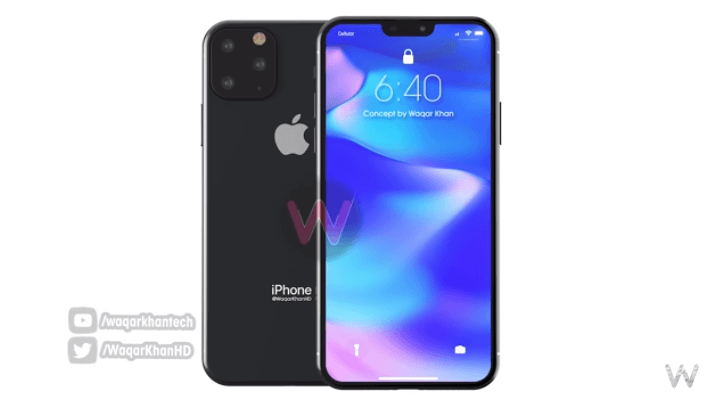 We have already seen a handful of Apple iPhone 11 Max concepts with triple rear cameras. One of them has a square bump on the back to accommodate the three lenses in a triangular fashion, an LED flash, and a microphone. Another has the three cameras arranged horizontally in the top half of the rear panel. Sources told Bloomberg that Apple would also double the length of Live Photos from 3 to 6 seconds. The Live Photos feature was introduced in 2015, but hasn’t received any major upgrade since. Talking about the 2020 iPhones, the publication noted that the next year’s flagship would feature a laser-powered 3D camera on the back to enhance depth perception and augmented reality (AR) experiences. The dot projection system on the TrueDepth camera of current iPhones has a range of only 25-50 centimeters. It powers the Face ID technology. In contrast, the laser-powered 3D camera on the 2020 flagship would have a range of up to 15 feet. It is said to use Sony’s Time-of-Flight sensors to “scan the environment to create three-dimensional reconstructions of the real world.” Apple is currently in talks with Sony to use its Time-of-Flight technology in the 2020 iPhones. It creates 3D images of the scene by measuring the time taken by the light to travel to and from different objects in the scene. Apple had originally planned to introduce the 3D camera with this year’s iPhone 11 Max, but had to delay it due to technological difficulties. The feature would now debut with the 2020 iPad Pros and then in 2020 iPhones. The new iPad Pros would arrive in the spring of 2020. Meanwhile, Apple is working to update the iPad Mini and the entry-level iPad this year, which would continue to use the Lightning connector rather than the USB-C port for charging. The Cupertino company is said bring some exciting features with the iOS 13 software, which would come pre-installed on the 2019 iPhones. The iOS 13 would feature a system-wide dark mode for easier nighttime viewing, similar to what Apple introduced with macOS Mojave for Macs. It will also bring many iPad-specific enhancements like a new home screen, a better Files app, and the ability to tab through multiple versions of the same app like pages in a web browser. Apple would announce the iOS 13 at its annual Worldwide Developers Conference (WWDC) in June. Sources told Bloomberg that Apple was testing versions of 2019 iPhones with a USB-C port instead of the Lightning connector. However, it’s too early to say whether the USB-C will be included in the final version of the upcoming iPhones. Among other things, we can expect a faster and more secure Face ID and a more powerful A13 processor. Apple fans waiting for a 5G iPhone are going to be disappointed. The Cupertino company is working with Intel on 5G technology, and Intel’s 5G modem won’t be production ready until 2020.